Sharp LC-32LE210 review | What Hi-Fi? Back when flatscreen television sets first made a splash on the consumer electronics market, trailblazing company Sharp was one of the first manufacturers to really make a name for itself. This resulted in the company producing some blindingly good TVs that set an early benchmark for rival brands. But it's fair to say that over recent years, the ‘wow' factor seems to have deserted the company, restricting it to ‘average' and ‘perfectly decent' reviews, at least in the pages of What Hi-Fi? Sound and Vision. And there's no shortage of talent at this screen size, which can make it difficult for some sets to stand out from the crowd. Making its first impression, the LE210 doesn't look or feel out of place among its rivals. The glossy back frame and chassis give it a relatively flashy but purposeful appearance, though the functionality and features count are a little hit and miss. The lack of a Freeview HD tuner is disappointing in particular, and rival sets can better the Sharp's trio of v1.3 HDMI inputs. These gripes are slightly offset by the inclusion of a neat recording and time-shift function, though. This lets you record TV programmes onto a USB 2.0 memory stick. It's done at the rate of around 26mins per gigabyte of storage, so a couple of gigs should suffice for the odd soap opera or a spot of time shifting in between delicious cups of tea. The LE210 is also nice to use – the basic, colourful menu system doesn't confuse, while the remote has a nicer look and feel than Sharp wands of old. 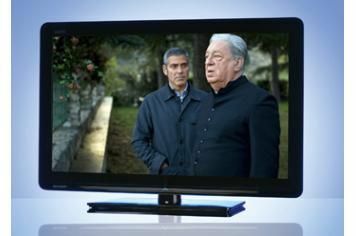 The Freeview tuner is fair, but some rivals offer a sharper, more stable picture. It isn't HD-capable either, which is another tick in the ‘against' column. Standard-definition pictures appear surprisingly focused, especially characters in the foreground of the image, although the picture doesn't appear quite as natural and filmic as it could. With Blu-ray, there's a brief rush of excitement as the Sharp's precision and detail once again come to the fore. But unfortunately, the TV then undoes all this good work by losing focus when it's presented with the first sign of any tricky motion. Colours are also poorly judged and slightly overcooked compared with the best. And then there's the sound quality – or, rather, the lack of it. The built-in speakers sound compressed, closed-in and way too nasal. If you were to buy this TV, we'd definitely recommend investing in external speakers. By the standards set by some of its peers the Sharp can only be described as average for the money. There's still plenty of room for improvement.